To what extent was Rosario "Russell" Bufalino involved in the disappearance of Jimmy Hoffa in 1975? In the CIA's recruitment of gangsters to assassinate Fidel Castro? In organizing the historic meeting of crime chieftains in 1957? Even in the production of The Godfather movie? Secretive—even reclusive—Russell Bufalino quietly built his organized crime empire in the decades between Prohibition and the Carter presidency. His reach extended far beyond the coal country of Scranton, Pennsylvania, and quaint Amish farms near Lancaster. Bufalino had a hand in global, national, and local politics of the largest American cities, many of its major industries, and controlled the powerful Teamsters Union. His influence also reached the highest levels of Pennsylvania government and halls of Congress, and his legacy left a culture of corruption that continues to this day. A uniquely American saga that spans six decades, The Quiet Don follows Russell Bufalino's remarkably quiet ascent from Sicilian immigrant to mob soldier to a man described by a United States Senate subcommittee in 1964 as "one of the most ruthless and powerful leaders of the Mafia in the United States." To what extent was Rosario "Russell" Bufalino involved in the disappearance of Jimmy Hoffa in 1975? In the CIA's recruitment of gangsters to assassinate Fidel Castro? In organizing the historic meeting of crime chieftains in 1957? Even in the production of The Godfather movie? Secretive—even reclusive—Russell Bufalino quietly built his organized crime empire in the decades between Prohibition and the Carter presidency. His reach extended far beyond the coal country of Scranton, Pennsylvania, and quaint Amish farms near Lancaster. Bufalino had a hand in global, national, and local politics of the largest American cities, many of its major industries, and controlled the powerful Teamsters Union. His influence also reached the highest levels of Pennsylvania government and halls of Congress, and his legacy left a culture of corruption that continues to this day. 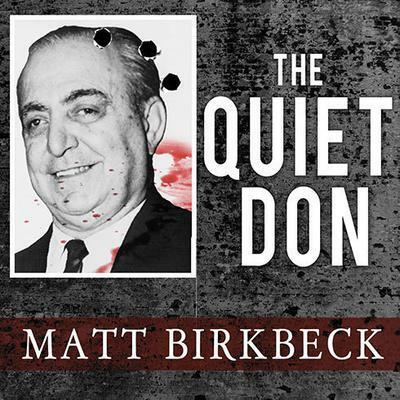 A uniquely American saga that spans six decades, The Quiet Don follows Russell Bufalino's remarkably quiet ascent from Sicilian immigrant to mob soldier to a man described by a United States Senate subcommittee in 1964 as "one of the most ruthless and powerful leaders of the Mafia in the United States."